(P1) These days, DRESSING UP for a flight doesn’t automatically mean you’ll get an UPGRADE, but that’s NO EXCUSE for dressing like a college kid late for their Monday-morning class. (P2) Certainly, flights are long and seats are uncomfortable. You want to wear something flexible. (P3) But you can look WELL PUT TOGETHER in less than 10 minutes if you just have your OUTFIT planned and ready before an early-morning flight. (P6) These days, most flights are OVERBOOKED, but in the rare instance that they aren’t, being better dressed than all the other SCHLUBS will give you an EDGE. (P9) If you’re bringing sweats and schlubby clothes that you don’t plan on wearing again on your trip, you’re wasting precious suitcase space. (P10) Wearing heavier items like boots and a sweater is not only a space saver, but practical: You can plan other outfits around those items, and thus have more ENSEMBLES while packing fewer clothes. (P12) Besides never knowing who you might meet on a plane, you’ll feel better about yourself once you land. You’re also taking a step toward making flying a SPECIAL OCCASION again — and you can’t tell me that travel isn’t a cause for CELEBRATION. (P14) Planes are their workplace. No one wants to wait on someone in basketball shorts and dirty flip-flops. Do you feel that society has gotten too casual? What was the last plane flight you took? Have you ever received an upgrade to first class? Do you talk to fellow passengers on a plane flight, or do you KEEP TO YOURSELF? Many people feel that plane flights were more ELEGANT and comfortable back in the 1960s and 1970s. 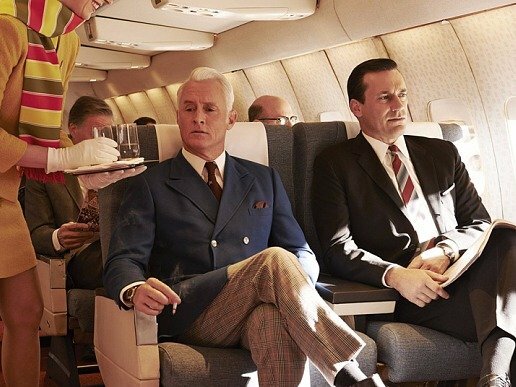 What changed about air travel?